Bristol, Tenn./Va. 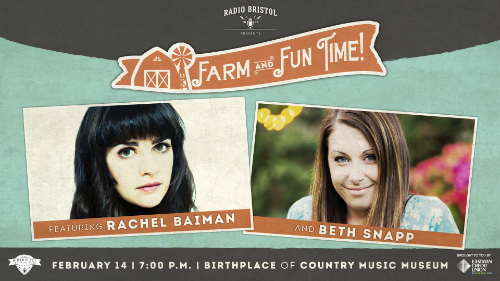 (February 7, 2018) – Radio Bristol’s Farm & Fun Time live variety show returns with a very special Valentine’s Day edition–one that includes musical guests Rachel Baiman, the critically-acclaimed folk singer songwriter and multi-instrumentalist, and our region’s own Beth Snapp, a singer-songwriter whose “Pop-Alachian” sound has mass, cross-genre appeal. In celebration of the anniversary of the entertainer’s 100th birthday, Farm & Fun Time will pay tribute to Bristol native Tennessee Ernie Ford with a homespun Heirloom Recipe segment featuring Ford’s eldest son Buck, as he shares a family favorite from the Ford family table. Farm & Fun Time host band Bill & the Belles will also treat audiences to a few favorites from “The Ole Pea Picker’s” catalog. A revival of the former WCYB radio program that aired from downtown Bristol in the 1940s and 1950s, Radio Bristol’s Farm and Fun Time is original programming the entire family will enjoy. Tickets to this Farm & Fun Time are now sold out, but Radio Bristol can be accessed 24 hours a day, 7 days a week on 100.1 FM in the Bristol area, online at ListenRadioBristol.org, and through the station’s free mobile app. You may also view Farm and Fun Time on Radio Bristol’s Facebook Live at Facebook.com/WBCMRadioBristol. For more information visit the Events page at BirthplaceofCountryMusic.org. Presented by the nonprofit Birthplace of Country Music, Radio Bristol showcases the diversity of American roots music from the early recording era to today. Reaching the world through their online media center, Radio Bristol produces original programming through recordings and live sessions from the Birthplace of Country Music Museum and the Bristol, Virginia/Tennessee region. Radio Bristol broadcasts on 100.1 FM in the Bristol area, online at ListenRadioBristol.org, and through the station’s free mobile app. The Birthplace of Country Music is the parent organization of the Birthplace of Country Music Museum, the annual Bristol Rhythm & Roots Reunion music festival, and Radio Bristol. For more information visit ListenRadioBristol.org.